Brick is a popular building material, highly preferred by Australian homeowners for both exterior and interior applications. Bricks combine excellent functional properties with great aesthetics. Bricks are low maintenance, offer thermal properties, are manufactured from natural materials, provide protection against the elements and are visually striking. However, there are many different types of bricks, making the brick selection process quite complicated. 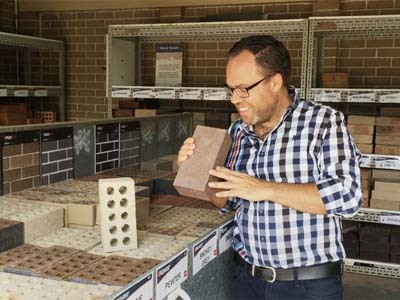 Interior design expert James Treble offers his insights into selecting the perfect brick for your dream home or upcoming renovation project. The brick you select will impact the overall look and feel of your home, so begin your search with research. Refer to the PGH Style Guide to streamline your decision process and visualise how the brick will complement or contrast with other external materials used on your home. Before selecting a brick, it’s important to consider the location of your home. For instance, if you live near the coast, selecting an exposure grade brick will ensure heightened resistance to salt damage. The texture of the brick, the pattern of the bricklaying and the mortar, all play extremely important roles in creating the look you want to achieve. Watch James Treble explain the brick selection process.